I often hear people talk about the “critical chain tool.” They may say “we plan to try the tool” or “please show us the tool.” There’s nothing directly wrong with this, but it can imply a disconnect in objectives that will make communication difficult. A screwdriver seems obviously to be a tool. Is an engine repair process a tool? Is a repair-and-logistics strategy for an airline company a tool? Each could be considered a tool at a different strategic level. It’s easy to distinguish between levels and objectives with a screwdriver and a repair process, but not so easy with an organizational change effort. A “critical chain” tool might merely help you to identify the most important tasks in your project plan. At another level, it might help you to synchronize your projects with your organization’s objectives. This picture, a kind of “tool breakdown structure,” shows one way of looking at the levels of critical chain-related tools. 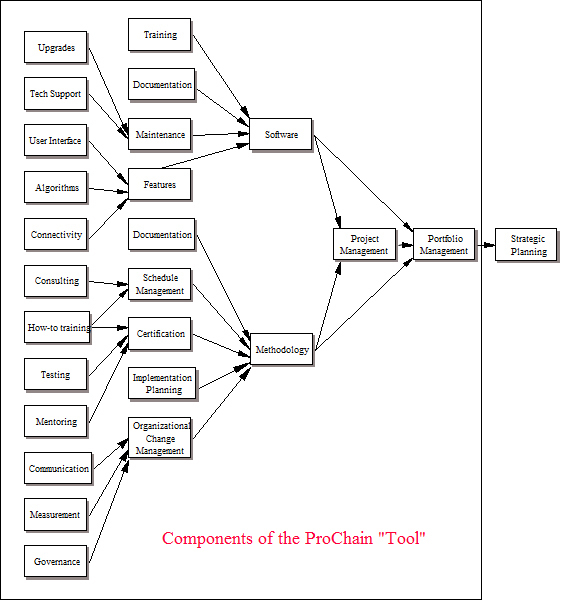 The list isn’t comprehensive but it includes many of the key elements of the “ProChain tool” when used to synchronize project and portfolio management. Software and methodology are important tools; within those categories, there are various lower-level “component” tools that we might – or might not – want to include in an implementation. An arrow from X to Y means, “The tool X is included in Y”. So … by all means, think in terms of tools. But as you do, also think about what level of problem the tool is helping you to solve, whether that’s the level of problem that you need to solve, and what the whole toolbox needs to contain.